Thursday 1 & Friday 2 March. Open 17:00-23:00 each days. Hardly "London area" but the only CAMRA festival within easy-ish striking distance this week so I've included it. About 70 beers plus a dozen or so ciders. The full beer list is available on Loughborough CAMRA website. 26 beers from 14 breweries. First sighting of beers from the Tiny Rebel brewery, about which I know precious little except that it is very new and based in Newport. The full beer list has been posted on the Rake's blog site. Thursday 1 March to Saturday 3 March. Don't know too much about this one - beer list is "coming soon" according to the Queen's Head Facebook page. 60 plus beers and ciders. There's a full list on the Grape & Grain website. Of particular interest, to me at least, are Ascot Anastasia's Triple Vanilla Imperial Russian Stout, Elland Scarlettes Fury, Kent Enigma and Kissingate Smelters Stout - all new beers (as far as I know) from brewers I hold in high regard. First appearance for Camden Town's US Hells lager at their new bar. Apparently a revised version of their existing Camden Hells Lager, replacing the German hops with US varieties. Brewery tours were available but I understand are now fully booked. You do not, however, need an invite to attend the launch and try the beer. Apologies if my earlier blog post gave that impression. A few more events for later in March have been added to the calendar. I'll provide fuller details nearer the time. Can't tell you much about this one, which I picked up from the CAMRA North London newsletter, so you can blame them if this is a bum steer. The pub is Good Beer Guide listed but I haven't personally set foot in the place for many a long year. Their website is not exactly illuminating about the festival. In fact it isn't mentioned there at all. 120+ beers from Yorkshire, many exceedingly rare and tough to find, even on their home turf. I will only be able to attend on Wednesday because I am actually heading for "God's own county" (not necessarily my own definition) and, more specifically, York (one of the greatest cities in the UK to visit - definitely by my own definition) for a long weekend on Thursday. York pub guide to follow in due course. Wednesday 22 February, starts at 6:00pm at the Bridge House, Tower Bridge Road, London SE1 2UP. Around 45 different beers available over five days, with 25 on sale at any time. Tends to feature several beers from each brewery, concentrating on a few breweries per festival, rather than ordering a single beer from many breweries. 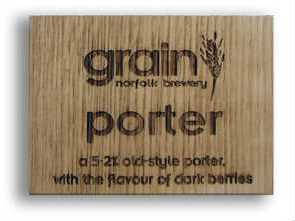 See the "currently in the cellar or on sale" listing on the pub website for an idea of what will be available. Friday 24 & Saturday 25 February. 60 or so beers. Admission by pre-purchased ticket only and all tickets sold out for this year. So, if you want to go next year, remember - book early. Friday 24 to Sunday 26 February. About 35 beers, all from the Greater London area. No further details available. Note to organiser: providing a list of the beers that will be available is a jolly good way of encouraging people to attend. Part of a series of country themed festivals covering the entire period of the Six Nations Rugby Championship. 11 to 24 February features Italian beers. 25 February to 9 March is Welsh beers. 10 to 16 March showcases French beers. 17 to 24 March is Irish beers. Exactly what beers might available and when is not at all clear since the website provides no information in that respect. Given the duration of the event, it is probably a fair bet that the odd beer from the featured nation will make an appearance alongside the (excellent and varying) other offerings, but greater clarity would have been welcome. I've also added a whole load of new events for March to May to the events calendar. Well, it really covers much of the South East and a fair few other events within day trip reach that I'm thinking of attending. In order to assist advance planning and for those of you who can't be bothered to click through to the calendar itself, brief details of the new additions (NB: this is not the full list of events in the period - some were listed already) follow. I'll provide fuller details nearer the time. 3 March: Camden Town Brewery - US Hells launch & brewery tours. 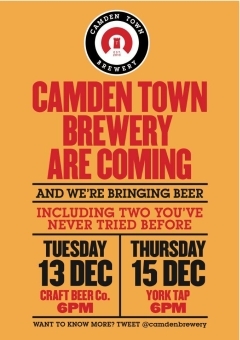 email mark@camdentownbrewery.com for an invite. Last week was a rather quiet one in the chriso blogging and social media world, partly because my mobile device was knackered but mainly because I was in Liverpool, Manchester and Huddersfield and, frankly, too busy drinking and enjoying myself to bother with all that malarkey. Over the next week or so I'll be attempting to update my Liverpool pub guide, write up a National Winter Ales Festival round-up and maybe find the time to sing the praises of Huddersfield as a beery destination too. In the meantime, I've added a few dates for the diary to my London events calendar. No so very long ago a London events diary would have been a rather skimpy affair. There were a handful of CAMRA festivals in and around London, plus the old ale festival and a few other events at the White Horse on Parsons Green, but that was about it. Now there's so much going on that it's difficult to keep track. The number of pub festivals has really mushroomed, with frequent fixture pile-ups. Meet the brewer evenings have become regular occurrences. New beer releases are often accompanied by a launch parties. The list goes on. And you have to keep a close eye on Twitter, Facebook, several websites and various other sources to keep up. Blink and you'll miss something. So, I'm trying to maintain a London beer events calendar. Mainly for my own benefit but I hope it may be of some use to others too. It also includes "selected" events outside London. By which I mean those that I'm thinking of going to. And it only goes up to May so far. It's not very pretty either but does the job for me. I hope it's fairly complete at the moment - the first week of the new year is not a particularly busy time for arranging and publicising new events. But I've probably blinked and missed something already. If I have, please feel free to let me know by commenting here or by contacting me directly. Last time I wrote about some promising new brewers that I first came across in 2011. This time I'll be highlighting ten more breweries that I think are worth keeping an eye on this year. Some are quite new, others are most definitely not. There won't be any new names for the well-informed. But I'm expecting (OK, in some cases there's an element of hoping too) they will all raise their game and progress to even better things in 2012. As before, the list is in no particular order of merit. Thwaites is a long-established brewery that many of a more beer-geeky persuasion would regard as a member of the fuddy-duddy old guard, producing boring beers for conservative drinkers. Some might even suggest that they employ uninspired brewers who are incapable of producing anything else. I do not believe that to be the case. I'm sure there are many very skilled brewers working for these medium sized family/regional brewers that could crank out some excellent and adventurous brews given the opportunity. Thwaites has certainly displayed signs of more ambition in its output. First of all there was their Craft beer range of monthly specials that included a cloudy wheat beer and an American style IPA, neither of which I got to try. Then there was Old Dan, a strong 7.4% ale that I didn't feel quite hit the spot but was certainly a move in the right direction. 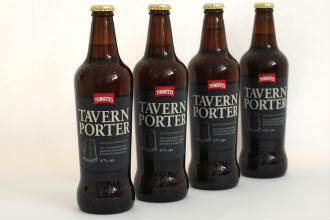 However, I was really impressed by Tavern Porter, a roasty slightly smoky bottle-conditioned porter with plenty of rich chocolate notes. There have been other encouraging signs within the old guard and I really just singled out Thwaites as indicative of that. I'm hopeful of more progress in the year ahead. When the Brodie siblings relaunched the old Sweet William brewery, located at William IV pub in Leyton back in 2008, little did I realise that, two years on, they would have produced over a hundred different beers in a bewildering range of styles and strengths - quite a feat in itself. Of course, there are dangers in such an eclectic, some might say scattergun, approach. Let's face it, not every brew is going to be an unqualified masterpiece with so much experimentation afoot. And there have been rumblings that trying to serve too many of their beers at the same time at the William IV has led to quality issues. But, in general terms, I love what Brodies are doing and the way they are doing it. Superior London Porter, one of the first Brodies beers I tried, and one of the relatively few regulars in their range, remains a favourite. A recent distribution deal with Boggart means that Brodies beers are likely to get out and about more. I was surprised, on checking some details on Windsor & Eton, that they only started brewing in April 2010. They seem to have been around for longer than that. Progress has been measured and considered. They started with two decent, if unspectacular, brews in Guardsman and Knight of the Garter and, for quite a while, made little else. 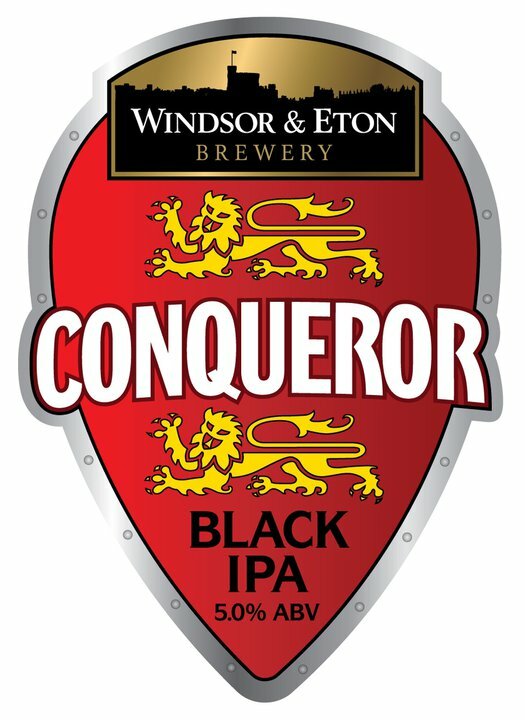 The appearance of Conqueror, a black IPA, signalled a more expansive intent and it quickly became a signature brew. A stronger version - Conqueror 1075 - and Republika, one of the best British lager interpretations I've come across, followed. I don't expect a plethora of new and experimental brews from these guys but I do anticipate further development, in that same measured and considered fashion, in the year ahead. Another very accomplished brewer that has become something of a stalwart on the London scene in barely two years of existence. I have not tried a beer from these guys that I did not enjoy a lot. Big Chief was one I particularly liked in 2011. Redemption has certainly developed a local market with plenty of success and, of course, the idea of local consumption is certainly one that is gaining traction. But local is, in itself, not enough. Local but not very good and not very interesting doesn't really do it for me. Thankfully, Redemption manages to strike an excellent balance. Having recently had the opportunity to sample some of Andy's small batch home-brews, there could be a lot more interesting and adventurous beers to come. Assuming, of course, Andy is given the leeway to produce them. 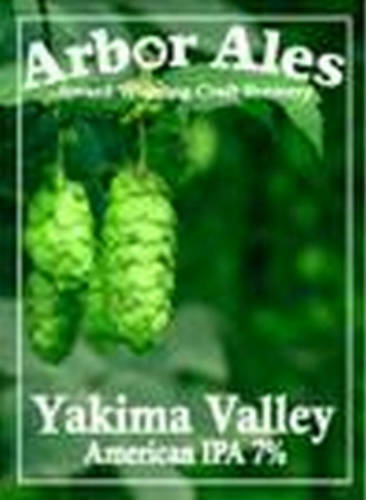 Arbor first brewed in 2007 and was not averse to producing some strong IPAs, stouts and the like from the outset. But they really seemed to up the pace, and their profile, in 2011. They have a lot of variation, innovation and quality across their range. More of the same in 2012 please. Although maybe not to everyone's taste, their 500 Minute IPA, a 10.7% monster crammed with hop character, was indicative of the willingness to take a walk on the extreme side here. In a less extreme, but still assertive mould, Yakima Valley American IPA more than held it's own alongside some US IPAs from across the pond at the Great British Beer Festival. Whilst we're on the subject of hop lunacy, these guys are at the top of the tree. Gazza and Dave do not have their own brewery and both hold down full time jobs. 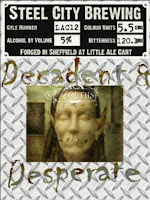 But they manage to find the time to brew beers that they like at Little Ale Cart brewery and elsewhere. And what they like is invariably uncompromisingly, some might say insanely, hoppy, usually pretty pale in colour but with is the odd stout or porter from time to time. Decadent & Desperate, a 120 IBU "C" hop showcase particularly took my fancy. These guys never make the same brew twice and, if you really want to experience a vitriolic tirade, just suggest they use more crystal malt. I don't expect too much to change here (unless, of course, they decide to go full time) but I would like to see more of their beers finding their way out of their Sheffield heartland. The Sadler family commenced brewing at the Windsor Castle pub in 1900 but the last pint flowed from the brewery in 1927. Until, that is, a subsequent generation of the Sadler family re-opened the brewery in 2004. But Sadlers would not have been a name that featured prominently on many of the geekier beer geeks' must try lists. However, their aptly named Hop Bomb, which I supped at the Great British Beer Festival was right up there with the efforts of any of the better known hop loving brewers in terms of impact and depth of flavour. It was one of the few beers at the festival that made a big enough impression on me to go back for a second. And it's a reminder, if any was needed, that it's not just the usual suspects that can produce beers such as this and make a damn fine job of it. More please. In a beer scene where use of the word "solid" can convey a sense of damning with faint praise, Grain is a brewery to which I can apply the term in a wholly appreciative manner. Sure, there are some fairly mainstream beers in the range, but there's a fair amount of adventure and ambition too. Execution is generally first-rate and quality across the board is high. These guys deserve more attention. Their Porter was a particularly fine example, in a fairly traditional style and an excellent illustration that a beer does not necessarily need bells, whistles and the kitchen sink to make a big impression. The Plough in Norwich, which is operated by the brewery, is a very convivial spot in which to sample their wares. And finally. If I had an award for most improved brewer of the year, Buxton would certainly be well in the frame. They started brewing in a not particularly attention-grabbing, and somewhat confusing (beers were first produced at Leek brewery, they then took over and moved into the premises of Wild Walker, then produced beers under both Wild Walker and Buxton names foe a while) fashion, but really started to deliver the goods in impressive style in 2011. Axe Edge, Black Rocks and Tsar would all be on my shortlist for beers of the year. 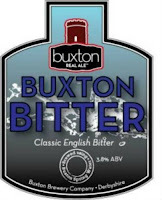 And, as far as traditionally styled session bitters are concerned, Buxton Bitter is in the top flight. Things are already great here, but I'm confident they can only get better. Inevitably with a list such as this, as soon as I'd finished typing I found myself thinking of other brewers I felt I perhaps should have included. So much so that it almost became a "20 to follow" article. But I had to draw the line somewhere and the UK beer scene is so vibrant these days that there are bound to be worthy candidates that get left out. So, many thanks to all the brewers that have provided me with so much enjoyment over the last year, often for so little reward. I raise my glass to all of you. It's that list time of year so let's get it over and done with. First of all, my most promising new breweries of 2011. Some of these may have started in 2010 but I didn't come across any of their beers until 2011. In most instances I do not have a huge body of evidence to work with. In some instances I've tried just one or two beers from the brewery concerned. 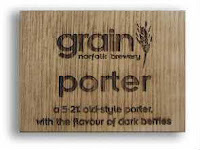 But I have high hopes for all of them and look forward to getting the chance to try more of their beers in 2012. Oh, and there's no outright winner here, just a "best of " list in no particular order of merit (alphabetical actually). I first came across beers from Pitstop brewery in 2009 at Reading beer festival. Three beers, three imperial stouts and pretty damn good ones at that. At the time, the beers were brewed at Bellingers garage near Wantage, an enterprise that had already attracted attention for incorporating a shop that stocked a crazy range of beers in a most unlikely location. Subsequent beers, such as the appropriately-named The Hop reinforced the impression that this was a brewer with a distinctly idiosyncratic approach. 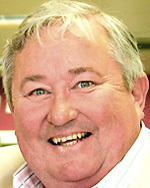 Since then the Pitstop brewer, Peter Fowler, and Bellingers have parted company. Peter is now running the Shoulder Of Mutton pub in Wantage and a brewery at the pub is in the works. In the meantime, Peter is brewing beers under the Betjeman name at a couple of local breweries. I can't say I was surprised that the first Betjeman beer I encountered - Sebastopol - was an imperial stout. And a pretty damn good one. I've not yet encountered any more Betjeman beers but I have little doubt that, when I do, they will be in the same uncompromising mould. Regular visitors to Reading beer festival may have noticed Binghams beers on sale there as "charity" beers for a few years. However, Binghams went fully commercial in 2011 and are showing a welcome degree of adventure, including some interesting stouts and IPAs, in their line-up. So far, I've been most impressed by their Coffee Stout and its Vanilla variant, but all the beers I've tried have been extremely solid. Binghams beers are mainly available in pubs in and around Reading but they have recently started bottling their beers, which can be bought from their on-site shop, or online from their website. I don't know much about this outfit other than that they commenced brewing in the Spring of 2011 and are based in Coventry. I came across two of their beers at Egham beer festival in August but have not seen them anywhere else. Phoenix Gold made good use of American hops, as did their Urban Red. Both were well-balanced and exceedingly drinkable. Coventry Bitter, a more traditionally styled session bitter seems to have made a good impression too but I haven't come across that one yet. I have to admit that Coventry is not a place that is high on my list of places to visit but I hope to see more of Byatt's beers in the year ahead. 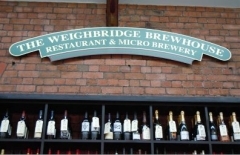 Good, purpose built brewpubs are rather rare in the UK. Based in an old foundry building in Canterbury, these guys seem to have made a good job of it. I say "seem" because I've not got round to visiting yet. The beers I've tried have been thanks to hand-bottlings by my friend, and Kent resident, Ian Harrison and a couple of sightings at festivals. There's no shortage of ambition here - they have tried their hand at a number of more interesting styles, including American and European, and have generally succeeded pretty well. 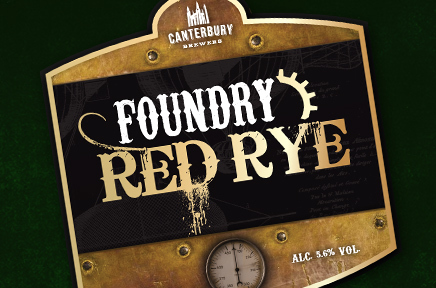 I particularly enjoyed their Foundry Red Rye and Street Light Porter. Some barrel-aged beers are on the way. Time for a visit to Canterbury methinks. I've written about this outfit before so won't say too much more here. 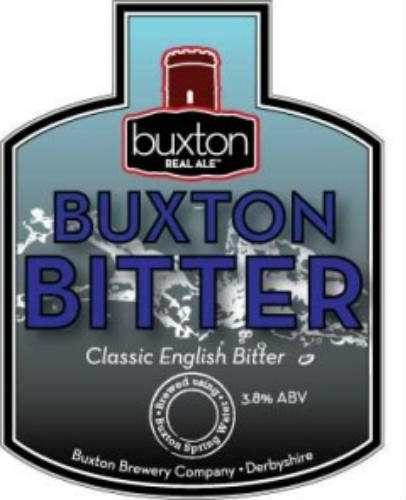 Just that Steve Gray, the brewer, is producing some very decent beers from a small brew kit located in the pub kitchen and that the Bull is a very convivial setting in which to enjoy them. I've particularly enjoyed their Nervous Energy, an American influenced pale ale using plenty of Cascade and US Brewers Gold hops but retaining a high level of easygoing drinkability. It's hard to believe that Magic Rock has only been in operation since May 2011. Their beers have already made a big impression and there's not really much more that I need to say here. Although Magic Rock makes excellent beers across the board, and has some very weighty, strong and impressive specimens in their range, I enjoyed Curious as much as any. Not least because it was one of a number of sub 4.0% beers appearing during the year demonstrating that relatively low ABV does not necessarily equate to low flavour and impact. And, for me, it was strong contender for being the best of them. Redwillow brewery is based in Macclesfield, Cheshire and actually started brewing in late 2010 but I didn't get to try any of their beers until well into 2011. From what I've seen so far, I'd be surprised to find too many boring brown bitters in Redwillow's portfolio. Ageless, a 7.2% IPA, was my pick of the beers I've tried up to now and I liked Smokeless a lot too. But I've not had one that I did not enjoy. A small outfit based in a small village in Hampshire and firmly focused on a local market so it might take a bit of effort to sniff out their beers. Staying local is certainly a business model that has attractions but many of the brewers that adopt it stick to making firmly traditional ales that are, frankly, a bit boring. 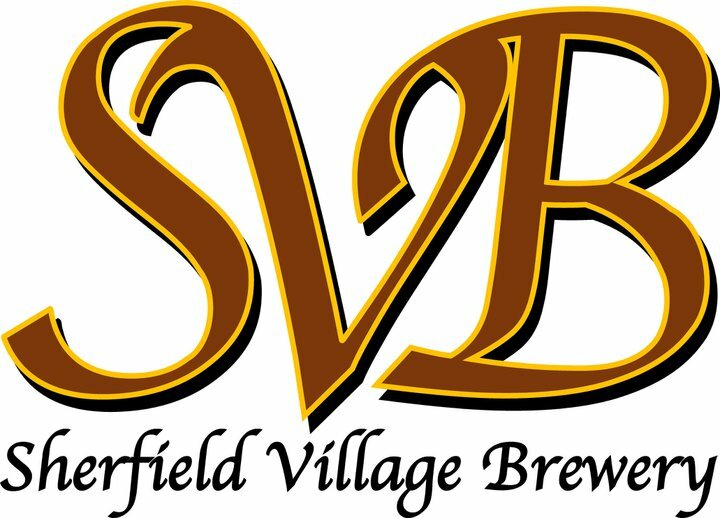 Not so with Sherfield Village. 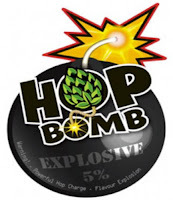 Whilst they do include some rather traditional offerings in their repertoire (and nothing wrong with that), they also spice things up with a good number of beers making generous use of New World hop varieties. Of the Sherford Village beers I've tried so far, I've been most impressed by Solo Quintessential and Pioneer Stout. Primarily a brewpub (and a rather foody one by the look of it), located on the old Archers brewery site in Swindon. I've not visited because, well, I can think of very many places I'd rather go to than Swindon. It wasn't until the end of the year, at Pigs Ear beer festival, that I first experienced their brews. Three were available and, although there was nothing particularly innovative in terms of beer styles - two bitters and a golden ale, they were all excellent examples and stood out amongst a lot of rather similar beers at the festival. I've been too lazy to write up my reviews yet, but I particularly enjoyed Pooley's Gold. 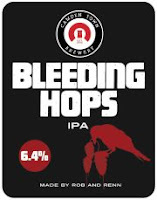 Another latecomer, which commenced brewing in September 2011 and I have to admit I had not heard of until I saw a couple of their beers, again at the Pigs Ear festival.. The first beer I tried - Cascale - was a real corker. The people behind Wilson Potter are two women - Kathryn Harrison and Amanda Seddon - and I see from their website that they visited Tara Mallinson to get some tips before they started the brewery. That does not surprise me one bit as the Cascale - pale and hop driven with lots of juicy, tangy citrus - exhibited many of the characteristics I've typically come to expect from a Mallinsons beer, and I mean that as a compliment. I'm very much looking forward to trying more from Wilson Potter in future. So, that's the newcomers dealt with. 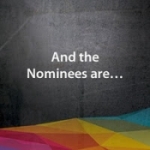 In the next couple of days I'll put together my Ten To Watch For 2012 list. Not necessarily that new, not necessarily too obscure - just those that I expect to kick on to better (and bigger?) things in 2012. In the meantime, happy new year to one and all. Things have been very quiet round here for rather a long time so let's get cracking on the New Year's resolutions a bit ahead of schedule. On Tuesday evening I was confonted by something of a fixture clash. Down in the city at the the Craft Beer Co a meet the brewer event featuring Camden Town brewery, including the launch of two new beers, was taking place. Just an hour later, in the more leafy realms of the Ham & High, two new beers from the London Brewing Co beers would be making their debut at the Bull. Being well aware just how easy it is to get "stuck" in the Craft, I was harbouring serious doubts that I would make it to both events but, aided by some prodding and cajoling from friends (to travel with them rather than leave them at the Craft, I'm relieved to say), I managed to do so and I'm glad I did. And I even found time for a last pint or two at the Southampton Arms too. 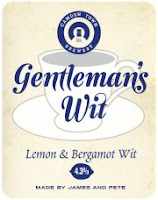 The first new Camden Town beer I tried at the Craft was Gentleman's Wit, described as a Lemon & Bergamot Wit, apparently utilising lemons covered in Bergamot and roasted for 20 hours. To be honest, I'm not sure what aromas and flavours Bergamot imparts but I do know (OK with a little help from Wikipedia) that it is used in Earl Grey tea and was a major component in the original Eau De Cologne - guess I would need to have been an England rugby player in the 80s to know what that tastes like. The beer certainly did have an aromatic, spicy character and plenty of sharp, citric bite. The appearance was pale and hazy. Very crisp and refreshing on the palate. Tart, with a little sweetness to balance things out. British takes on the Belgian Wit style can be pretty dire but this one hit the spot rather nicely for me. Next up was Bleeding Hops, a 6.4% IPA, heavily hopped with a whole cocktail of different hop varieties. To be honest, I was a little taken aback by the quite dark tawny colour. Perhaps I wouldn't have been if I had taken the trouble to read the blurb first. There were certainly plenty of juicy resinous hops in evidence. Lots of malty notes too - quite nutty, with some toffee and caramel as well. I assumed these elements, and the relatively dark colour, were due to the use of Crystal malt but Mr Dredge assured me that was not the case and the malty elements are derived from Aromatic malt, which is apparently a Munich type malt, often used in Belgian style beers such as Abbey Dubbels. This was a tasty and quite weighty mouthful but I have to admit it was not entirely to my taste, inhabiting an area somewhere between a paler aromatic IPA and the fuller, roasted feel of a black IPA, with a fair amount of sweetness. I have felt the same about some of the fatter, sweeterCrystal-influenced IPAs I have tried in the USA so it's just a matter of personal preference. 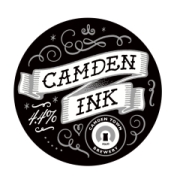 The pick of the bunch for me was Camden Ink, a 4.4% dry stout which had launched a few days earlier. Maybe mounting a major challenge to Guinness is a somewhat distant prospect, but that's the market sector it's clearly aimed at. And it's a far more enjoyable beer for me in every respect. Yes, it's inky black. Yes, it has a creamy head and consistency but it isn't nitro'd to within an inch of it's life, nor was it chilled out of all recognition. On the palate it's dry and smooth but much richer and more flavourful than Guinness, with subtle coffee ground and dark chocolate notes apparent alongside the roasty malt. There's a pleasing bitterness here but it's coming as much from good use of hops as from burnt malt. As you may have guessed, I was rather impressed. 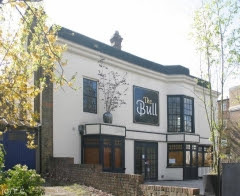 As easily as I could have remained ensconced in the Craft, it was then on to a bus, over the hill and far away to the Bull in Highgate, which I have written about before. This is a truly integrated operation with the tiny brewery (using the name London Brewing Co) squeezed into the kitchen so that the brewer, Steve Grey, literally has to rub shoulders with the chef. He seems to spend a fair amount of time pouring and serving too. A couple of weeks ago Gazza Prescott, hophead supreme from Steel City Brewing, dropped in for a collaboration brew. Given Gazza's leftward leanings and the presence of a certain grave in the nearby cemetery, naming the 4.3% collaboration brew Full Marx was a no-brainer. Knowing Gazza's preferences, I was expecting some pale IBU insanity. 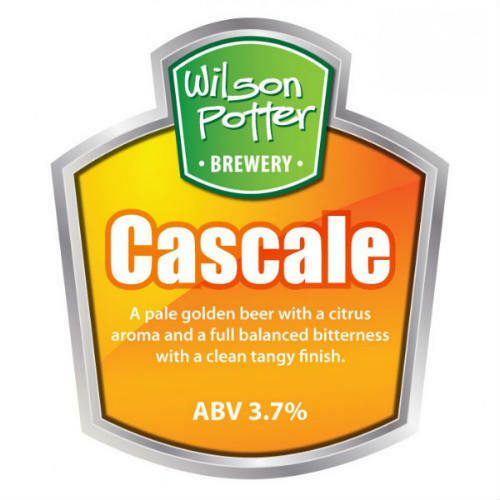 However, whilst the beer was indeed very pale in colour, the hopping was relatively restrained (for Gazza) with as much emphasis on flowery, aromatic character as bittering. According to Steve, had Gazza been given an entirely free rein, the beer would have been "too hoppy for Highgate". There was a bit of sulphur and some farmyard/manure notes on the nose. And I mean that in a good way. The mouthfeel was clean and firm. Overall, this was a hoppy, but well-balanced and immensely drinkable brew. Also on show for the first time was Pi Eyed - well it used the Pi symbol on the pump clip but I don't know how to type that. This was a darkish red, fruity and slightly sweet Wintery number. Some sharp notes in the fruit on the palate provided a balancing and agreeable old ale type character. I found this a satisfying and tasty beer too. I very much like the Bull as a pub. Unlike a lot of refurbishments, it gets the balance right on many levels. And it's good to see the brewing side of things doing well too. There are a lot of great beers out there. I’m not sure I’ll ever be able to try them all. But I’ll give it my best shot. Sometimes I write about them too. Lots of people call me chriso. Some actually seem to think it's my real name.